Google is seemingly prepping to offer custom email addresses to Gmail users for as low as $2 per month, if a new report on GSMArena is to be believed. The website claims that Google is going to offer a whole new plan for $2 alongside its existing plans for business users, which cost either $5 or $10 per month for each user depending on the options chosen. Google however seems to have removed any mention of its rumored upcoming offering from its site soon after the news of the plan's impending rollout started getting reported in the media. As for the rumored new plan, it will reportedly allow existing Gmail users to switch over to a custom ID (say, from yourname(at)gmail.com to yourname(at)yourdomainname.com). Folks at GSMArena were able to grab a screenshot while the service was still being offered to select users. As per the screenshot, the rumored upcoming service has tentatively been named 'Gmail Custom Address', and won't come with any bells and whistles like additional storage or online support. However, it will be a fairly cheap way of getting a customized email-ID that usually costs a minimum of $5 per month for each user, as part of the company's 'Gmail for Work' plan which comes with 30 GB of storage instead of 15 GB for users of the free service. 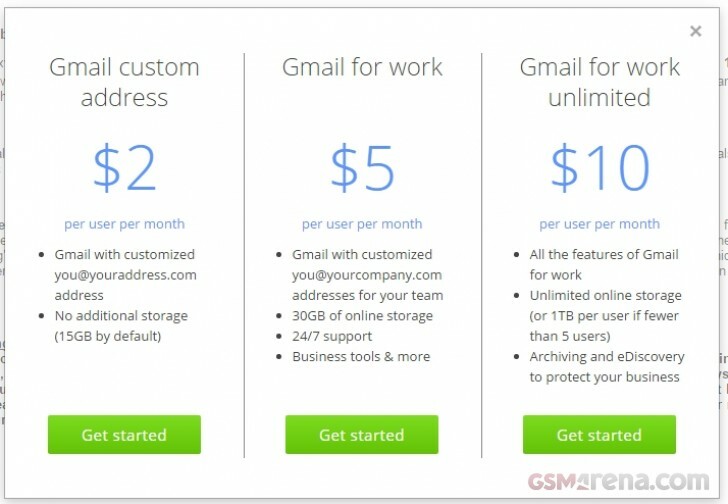 The 'Gmail for Work Unlimited' plan meanwhile, comes with a $10 price-tag per user for unlimited cloud storage and archiving facilities. As evident from the screenshot posted alongside this article, before being removed from Google's site, the newly conceived plan came with a green 'Get Started' button, clicking on which apparently opened a pop-up which asked for details of the user's existing top-level domain name, which would form the basis of their custom email ID. The pop-up also reportedly informed users that this particular feature is still a work-in-progress and will not be available with immediate effect. However as per the report, there were no indicators about how long it might actually take Google to roll out this feature. Or for that matter, if it will eventually be launched globally or be restricted to North American users at least to start off with. Hopefully, we'll have more of an idea sooner rather than later, as Google readies itself for the commercial launch of this all-new service-tier.